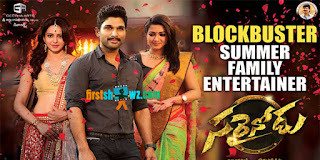 Allu Arjun's Sarrainodu opened to good start in US and the film is doing fairly well at the Box Office. The Boyapati Srinu directorial is running with packed theaters. From the second day, the collections saw a steep increase. Classic Entertainments, which released the film in Overseas, is happy with the response the film is getting by all set of audiences. Notwithstanding mixed reviews, the movie is drawing crowds. Brahmanandam's comedy, scenes involving Allu Arjun, Srikanth are enjoyed by audiences. Stylish action episodes, Allu Arjun's new body language are enthralling the people. Fandango, one of the most popular ticketing service, is now offering discount cards to buy movie tickets for Sarrainodu and these discount cards are valid at any theater which has a Fandango ticketing system. Here are some of the links which enable the audience to buy tickets at a discount. On a similar note, Carmike, one of the largest theatre chains in the US, is offered $5 off on ticket pricing for Sarrainodu. This Carmike Discount Offer is valid in all of Carmike, Muvico and Digiplex Locations. Get 20% off per ticket on Theater Pricing. Get ready to feel the thrill and be mesmerized by Stylish Star Allu Arjun and rest of the cast. Nothing comes close to watching a big action movie in theaters. Book your tickets now and watch Sarrainodu at a theater near you!